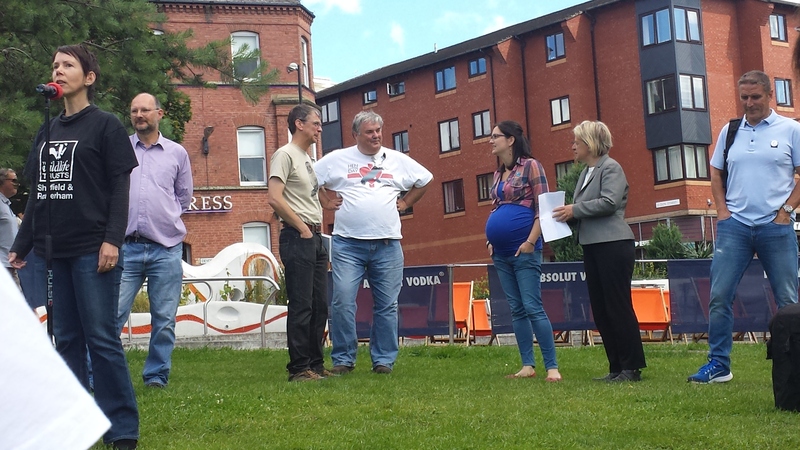 I've just had a fabulous morning in Sheffield at the Hen Harrier day (after 3 hours with the Peregrines). Dr Ross Cameron, Senior Lecturer Landscape Management & Design at the University of Sheffield. They were all excellent speeches but I think our own Blánaid's was the best for me. Would love to have been there D! Can we expect some super views of our birds? It's been a lovely morning at the rally Wendy, also mentioned to David about the page refreshing,I've got to remind him monday. Good that you got a chance to chat with our eminent Prof! Seen first batch of pics now ... excellent as usual, thanks D! Thanks for the photos Hazel my one and only sighting was a very distant view of your last photo. We see more in winter now than summer, sadly numbers of breeders seem to be well down these days. I've yet to see one. Hope they start to thrive very soon and that I live to about 100 and manage to see one before I join the hereafter!